On November 28, the Loveland City School District held the second Building Tiger Nation Community Meeting, with over 100 members of the Tiger Family and greater Loveland community in attendance. In a presentation of the results of the educational facility evaluation conducted over the past six months, a panel of students and teachers shared their personal experiences regarding the implications of the current school facilities on teaching and learning at Loveland. The educational facility evaluation, which has been part of the assessment phase in the master planning process, focused on five main areas and how the school facilities currently perform in each: whether there is adequate academic square footage; building navigation (taking into account hallways, circulation spaces within the buildings, as well as parking and traffic patterns); the potential for expansion of buildings at the various campuses; how the buildings serve students and staff in terms of health and wellness; and whether the buildings and learning spaces are inspirational and relevant for today’s students. 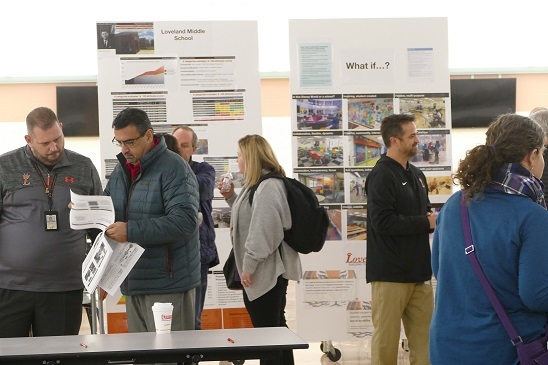 The meeting was the second in a series to inform the Loveland community about the facilities master planning process since the start of the 2018-19 school year. Finance Committee meetings, open to the public, continue to be held monthly. The master planning process now moves from the assessment phase on to the translation phase, and the first options for a master plan will be developed over the coming weeks. They will be presented to all Loveland stakeholders at Community Meeting #3 on January 23, and will then be evaluated, prioritized, and finalized. The master plan, along with financing suggestions, will be presented to the Loveland Board of Education in spring, likely April or May. A ballot issue is expected in November 2019. For more information, please visit www.buildingtigernation.org. Photo caption (top image): At Community Meeting #2 on November 28, students shared their needs as they relate to the Loveland Schools facilities. Photo caption (bottom image): Community members toured the “gallery” and learned about specific needs in the various school buildings. Article posted on December 3, 2018.